"I thought I knew Eric Andersen's music pretty well after listening to performances, skull sessions, songs in progress. But this new album, conceived largely in Europe, recorded in New York, has handily exceeded my expectations. There's a hard-won focus, and a deeply-felt commitment, evident in every performance, every finely-tuned lyric line...This is great American music from one of the masters. And it's about time." --- Robert Palmer, from the liner notes to "Ghosts Upon The Road"
With the re-release of "Ghosts Upon The Road", Plump Records is proud to be a part of the distinguished career of Eric Andersen by once again making available an album of timeless quality. In 1988, Eric recorded "Ghosts Upon The Road" with producer Steve Addabbo (Suzanne Vega, Shawn Colvin). The album features the talents of Andy Newmark on drums, Michael Visceglia on bass, Mark Hamza on keyboards, Michael Blair on percussion, John Leventhal on guitars and Shawn Colvin on backing vocals. According to Rolling Stone, who awarded it 4-1/2 stars, the album is "a masterwork" comprised of "music of rare intelligence and finesse...one of the best albums of the 1980s." 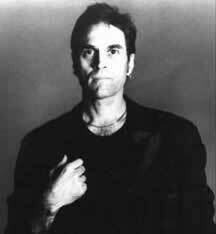 Eric Andersen is one of America's finest lyric-poet songwriters. With a career spanning almost 30 years, he stands with his contemporaries --- Bob Dylan and Joni Mitchell --- as one of the few remaining pioneers of the '60's singer-songwriter movement continuing to do important work. He was born in Pittsburgh, PA and grew up in Amherst, NY. After two years of college, he took his guitar and headed west in search of his literary heroes of the Beat Generation. In the early 1960's, Eric was discovered in a San Francisco coffee house by Tom Paxton, who invited him to New York to join the Phil Ochs/Bob Dylan writing circle. Soon his songs were being covered by artists such as Judy Collins and Peter, Paul and Mary. Throughout the '60's and '70's, Eric recorded a variety of albums for Vanguard Records, Warner Brothers, Columbia Records and Arista. His collaborators included Patti Smith, Janis Joplin, Buddy Guy, The Band and The Grateful Dead. The Dead also recorded versions of his songs, as did Linda Ronstadt, John Denver and Rick Nelson. In 1966, Eric appeared in the Andy Warhol film, "Space," co-starring with Edie Sedgwick. In 1972, Eric's recording career reached new heights with the release of "Blue River" on Columbia Records. The Rolling Stone Album Guide in 1992 called it the "best example of the '70's singer-songwriter movement." During the 1980's, Eric settled in Norway and recorded independently-released solo albums. He returned to the mainstream with two critically acclaimed albums, 1988's "Ghosts Upon The Road", and his 1991 Columbia/Legacy album, "Stages: The Lost Album". Also in 1991, his collaboration with Rick Danko of The Band and Jonas Fjeld, a Norwegian artist, resulted in the Rydodisc album "Danko Fjeld Andersen". Their second "trio" album, "Ridin' On The Blinds", has just been released in Norway.